We have actually been in the throes of planting for a number of weeks already but with the beautiful weather that we have been having the past few days it really feels like we are in full swing now for the coming summer. It is very pleasantly warm in all of our hoop houses and Sydney and I harvested a little bit of spinach on Monday which made a lovely fresh summer salad. Hopefully next year we will have enough spring product to put out some spring CSA baskets. Sydney was pretty proud of her hard work to fill her basket up. Everything that we grow from seed in planted in stages. Right now we are and have been planting leeks, cabbage, onions, lettuce,and herbs. Every week the list will grow more extensive and before you know it we will be putting plants outside. 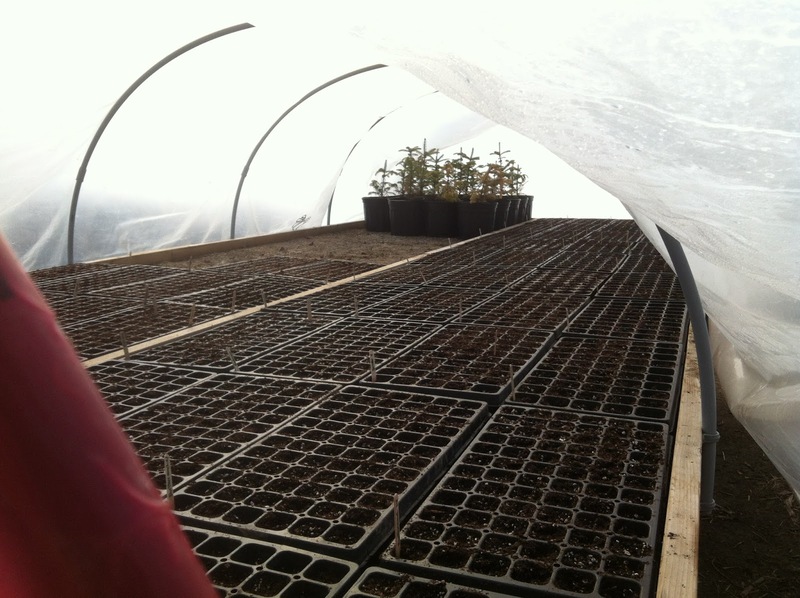 This is just one of our heated growing table. By next week it will be full of plug trays. It great to see the seeds sprouting the picture above is of leeks. They stay pretty small in the trays but once they get into the ground its amazing to see them take off into huge stalks. It is kind of a waiting game for the snow to clear and to hit consistent warm weather to really get things going here on the farm but as always we are looking forward to a great summer season.